Institute of Marine bioengineering which is located in Peking University ，Tsinghua University and Yantai University three university science and Technology Park, new and high-tech area of Yantai, China is an independent research and development of advanced technology enterprise.It is approved by the relevant departments of the state registration of enterprises. With the spirit of 'customer first, honesty first' principle, the institute has established the long-term cooperation with many domestic enterprises and research institutes. Warmly welcome friends come to visit, study, business negotiations. Tip mechanical stirring system, aseptic mechanical seal system, DC stirring motor or AC motor. Electric motor speed control available, PLC setting of rotation speed control. The top exhaust port is equipped with the pointer pressure gauge to display the tank pressure.The stainless steel valve adopts manual control. The optional pressure transmitter and automatic control valve realize automatic control of tank pressure. Switzerland pH electrode realizes high temperature steam disinfection. Standard configuration 1-way large-flow peristaltic pump time quantitative incremental feeding, with the volume of incremental or accumulation feeding being displayed and recorded. Siemens PLCcontroller true color touch screen with complete functions and stable running. 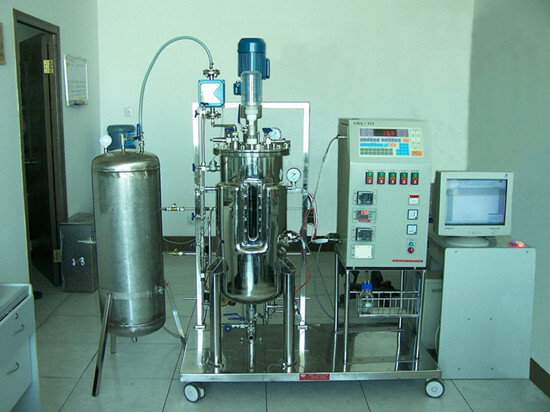 GBR series auto-controlled bioreactor(volume 2-500L) has been already appraised by the experts of Shandong Science and Technology Commission. Automatic phototroph bioreactor of fully transparent closed runway has been used in pilot and production scale.After that，it uses the new technology increasingly and strives for the development. Now it has already formed the GRB series entire automatic control，half automatic control bioreactor and the light bioreactor volume production. The product has sold to the whole nation and exported to Asian and the Mideast.